Antwerp, Belgium recently hosted the 26th International Conference on the History of Cartography, bringing together 150 of the world’s leading historians of cartography, geographers, spatial specialists, and young career scholars and practitioners. The biannual conference seeks to promote the critical historical study and analysis of maps, map makers and geographers, and their impact in society. conference director Joost Depuydt, Universiteit Antwerpen, and Imago Mundi, the history of cartography’s flagship academic journal, closely collaborated to bring the conference to fruition. A large Royal Geographical Society (with Institute of British Geographers) contingent attended, including (amongst others) retired RGS-IBG librarian Francis Herbert, Peter Barber, the British Library’s director of maps, former British Library map director Tony Campbell, Catherine Delano-Smith, Imago Mundi‘s chief editor, early modern map expert Chet Van Duzer, Matthew Edney, director of The History of Cartography series, and Imre Demhardt, a director of the International Cartographic Association. The week-long conference has become famous for its single-panel, single-room format, with no concurrent sessions. Each panelist presents to the entire conference. The week format also provides ample time for panels on nearly every conceivable topic in the history of cartography and the history of geography. Both Karen De Coene (Universiteit Gent) and Joaquim Gaspar (Universidade de Lisboa) articulated the longevity of maps’ usefulness: De Coene demonstrated how composite atlases remain potent sources of understanding the formation of geographical knowledge networks; Gaspar investigated how accurate the 1569 Mercator world map proved to be for maritime navigation – some two centuries before its full adoption by shipping firms. Linda Rui Feng (University of Toronto) highlighted how textual and non-cartographic evidence (e.g., manuscripts, letters, poetry) could be used to reconstruct early maps and regain previously lost geographic knowledge. ‘The concept of map (tu) in pre-modern China was a highly capacious one’, she argued, ‘and existed as part of an interface across the genres of text, pictorial illustration (also termed tu), and painting (hua)’ (Programme 32). Her work echoed David Cooper and Ian Gregory’s (Lancaster University)’s 2011 Transactions article ‘Mapping the English Lake District: a literary GIS’. In the latter piece, Cooper and Gregory discussed the possibilities of incorporating an array of visual, contemporary, quantitative, and qualitative information – from geographical coordinates to Thomas Gray’s 1769 account of his walking tour – via GIS to create a truly interdisciplinary understanding of one of the British Isles’ most famed natural regions. 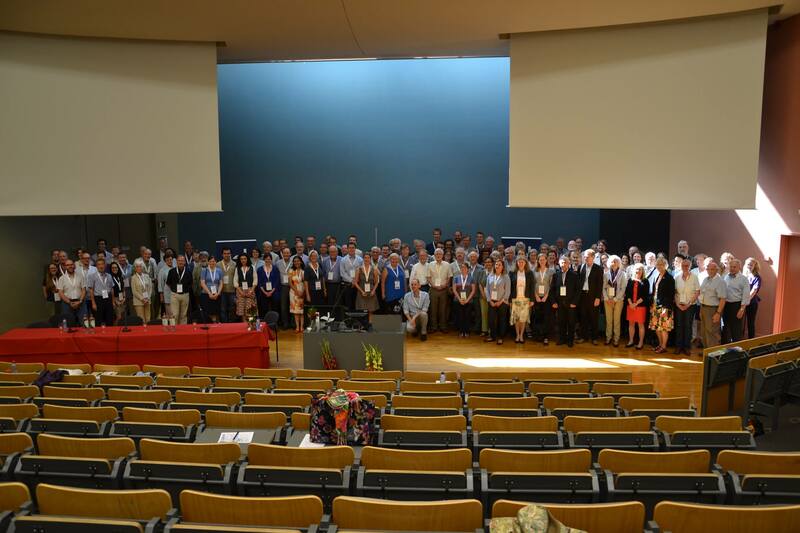 ICHC 2015 Antwerp attendees. Photograph (c) 2015 Joost Depuydt. Borders, boundaries, and their complex geographies constitute an important, recurrent theme in RGS-IBG journals. In ‘Border Landscapes’ (Area June 1989) Dennis Rumley (University of Western Australia) reported on a conference held to grapple with borders’ historic and contemporary problems: combating negative perceptions of border regions as poor, peripheral frontiers (175), critically examining ongoing bilateral border disputes, and re-examining historical disputes in a search for future solutions. Alec McEwan (International Boundary Commission) took a more focused slant, carefully deconstructing a century-old African boundary dispute. In ‘The establishment of the Nigeria/Benin boundary, 1889-1989’ (The Geographical Journal March 1991) he concluded that despite two clear imperial agreements cementing the boundary, a propitious lack of accurate and readily available maps, combined with the constantly-changing nature of the Okpara River, led to a nearly a hundred years of sociopolitical headaches, antagonism, and missed diplomatic opportunities. In a similar vein, Madalina Veres (University of Pittsburgh) turned her attention to the Habsburg’s forty-year failed effort to secure late eighteenth-century Lombardy’s frontier. She concluded that despite the Habsburg Empire’s best efforts, the deft use of conflicting maps and surveying engineers by three other monarchs prevented the region from being conclusively demarcated or controlled. Catherine Dunlop (Montana State University), author of the recently-published book Cartophilia: Maps and the Search for Identity in the French-German Borderland, buttressed Veres’ and McEwan’s respective points. In her analysis of Alsace’s fractured history, she promoted the role of maps as peaceful tools of negotiation and clarity, even in regions famed for armed conflict. As Federico Ferretti’s 2014 study on the role of cartography in the promotion of a unified Italy keenly demonstrated (see ‘Italy: A tale of popular geographic circulation‘, Geography Directions, 15 November 2014), maps have and continue to serve as vital assets in legitimising particular conceptions of ‘the state’, while subordinating or eliminating competing visions from public and private discourse. At ICHC 2015 Zef Segal (Ben Gurion University) examined how competing German states, actors, and organisations created, promulgated, and manipulated maps to promote their particular perspective of territory generally and ‘Germany’ specifically. In so doing, his ongoing research intends to unearth the complex cartographic and geographic politics of Germany’s modern formation. Geography is inherently global, a fact Max Moerman (Barnard College/Columbia University) kept close to heart as he embarked on his now in-press book, The Japanese Buddhist World Map: Religious Vision and the Cartographic Imagination. After identifying ships on eighteenth- and nineteenth-century Japanese Buddhist world maps ‘that otherwise vehemently rejected the cartography of European exploration and its attendant cosmology of a global Earth’ (Programme 52), Moerman launched an investigation into Japanese maps’ global history. He uncovered that Buddhist map makers negotiated the inclusion of particular European and Far Eastern geopolitical and topographical elements into a ‘cartographic hybridity’ that both reflected Japan’s gradual opening to the West and Japanese efforts to rectify their position within this globalising world. Moerman’s focus on the negotiated symbiosis of ‘East and West’ fits well with current trends in RGS-IBG scholarship. Mark Monmonier (Syracuse University) identified an area of geographical scholarship little examined in RGS-IBG journals: patents and invention. Transactions, for instance, has only discussed patents and the invention of geographic/cartographic-aiding devices in the context of agricultural efficiency (e.g., David Nally, ‘The biopolitics of food provisioning’ January 2011). In ‘Inventors and cartographic creativity’, he detailed how geography, exploration, cartography, and transportation has spurred a vast range of inventions, inventors, and gadgets, ranging from the vital to the curious. Building off of James Ackerman’s 2009 The Imperial Map and Peter Barber and Tom Harper’s Magnificent Maps: Power, Propaganda and Art (2011), Katariina Kosonen (University of Helsinki) discussed the influence of maps in popular newsprint and media. In ‘Passive resistance and raging propaganda’, she recounted the various means newspaper and magazine maps influenced or reflected charged public opinions in young Finland’s struggle to maintain independence from Soviet Russia. Kosonen tapped into a important topic of current geographic inquiry: the diffusion of geographic knowledge through mass media, how it is manipulated, and what it means for geopolitics and the discipline itself. Geography, as Frances Harris (Kingston University) wrote in a 2011 Geographical Journal commentary, is especially well suited to take an important place in media’s visual future. Tim Hall, Phil Toms, Mark McGuinness, Charlotte Parker, and Neil Roberts’ vital January 2015 Area article ‘Where’s the Geography department?’ sounded the alarm to secure maintaining academic geography’s future as a distinct discipline in British higher education. At ICHC 2015, scholars and research librarians detailed various efforts to keep geography and cartography influential, relevant, and technologically advanced. Martijn Storms announced the successful merger, digitisation, and promotion of the Netherlands’ three most important map collections, with the intent of connecting historical and contemporary Dutch mapping and geographical knowledge to academics and policy-makers. G. Salim Mohammed updated the academic community on Stanford University’s acquisition of the David Rumsey Map Collection, one of the most important private, digital collections in the United States. Later in 2015 Stanford will open the David Rumsey Map Center, a fully-digital geographic and geospatial library, to the public. ICHC 2017 will be held in Belo Horizonte, Brazil. Ferretti F (2014), Inventing Italy and the circulation of geographical cultures, Geography Directions, 5 February 2014. Ferretti F (2014), Inventing Italy: geography, Risorgimento and national imagination: the international circulation of geographical knowledge in the 19th century, The Geographical Journal 180: 402-13, DOI: 10.1111/geoj.12068. Hall T, Toms P, McGuinness M, Parker P, and Roberts N (2015), Where’s the Geography department? The changing administrative place of Geography in UK higher education, Area, 47: 56-64, DOI: 10.1111/area.12154. Harris F (2011), Getting geography into the media: understanding the dynamics of academic-media collaboration, The Geographical Journal, 177: 155-59, DOI: 10.1111/j.1475-4959.2010.00396.x. International Conference on the History of Cartography (2015), ICHC 2015 Antwerp: Programme & Abstract of the 26th International Conference on the History of Cartography: Theatre of the World in Four Dimensions, Antwerp: FelixArchief. McEwan A C (1991), The establishment of the Nigeria/Benin boundary, 1889-1989, The Geographical Journal 157: 62-70, DOI: 10.2307/635145. Nally D (2011), The biopolitics of food provisioning, Transactions of the Institute of British Geographers, NS 36: 37-53, DOI: 10.1111/j.1475-5661.2010.00413.x. Rumley D (1989), Border landscapes, Area 21: 175-76. Sacks B J (2014), Italy: a tale of popular geographic circulation, Geography Directions, 15 November 2014. Sacks B J (2015), What happened to the American geography department? Geography Directions, 8 April 2015. This entry was posted in Area, The Geographical Journal, Transactions of the Institute of British Geographers and tagged Alec McEwan, Antwerp, Belgium, Benjamin Sacks, borders, Catherine Delano-Smith, Chet Van Duzer, David Cooper, David Nally, David Rumsey, Dennis Rumley, Frances Harris, Francis Herbert, G. Salim Mohammed, History of Cartography, history of geography, Ian Gregory, ICHC 2015, Imago Mundi, Imre Demhardt, International Conference on the History of Cartography, Joaquim Gaspar, Joost Depuydt, Karen De Coene, Katariina Kosonen, Linda Rui Feng, Mark Monmonier, Martijn Storms, Matthew Edney, Peter Barber, RGS-IBG, Thomas Gray, Tim Hall, Tom Harper, Tony Campbell, Universiteit Antwerpen, University of Antwerp, Zef Segal on July 30, 2015 by Benjamin Sacks.